The chain tool turned to by professional mechanics. Because of the tremendous force needed to remove chain pins, this screw-type chain tool is made from investment cast steel. The fine thread and comfortable size enable easy removal of even the toughest chain pins. Like all Park Tool chain tools, the CT-3.2 is easy to use and built to last. Got the 3.2 chain tool as part of my 6770 to 6870 conversion. Tool works well with 11-speed chains. Worked well especially after using a multi tool chain tool for years. Plus I wanted to increase the tools in my bike box. Solid tool that I have used four times with no issues. Strong ,well built chain tool. This is a well built chain tool that will last a lifetime . All metal with a floating plate to accept all chains. Buy a couple of replacement pins when you get this and you're good for a long time. 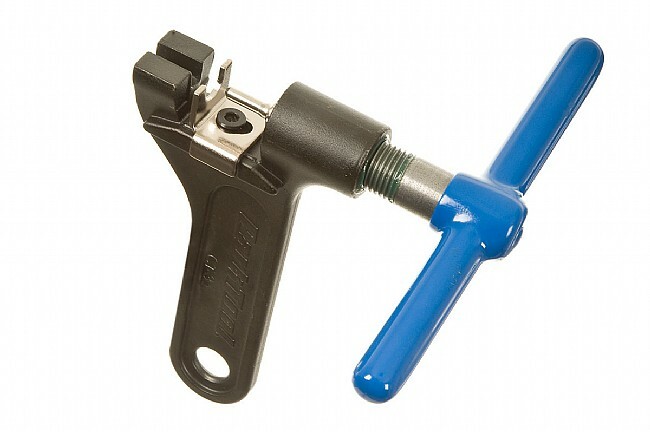 I have carried a compact chain break tool for many years in case something happened on the road, but when it comes to your home workshop you can't go wrong with this chain tool. Very easy to use and the large size requires minimal strength to break the links. The sliding section on tops allows you to use this on a variety of chains with different thickness. I have used the original CT-3 to change many chains over the years, from 7- to 10-speed. It works well, but the new CT-3.2 works better. The sliding shelf is great, and aligns the chain with the pin better than the old fixed system. I ride about 10K miles annually, so need to change chains several times a year. Having the best tool for the job makes it much easier. great tool. all you need. Great tool. Everyone needs one. To do the job well you need a great tool, this is a great tool. It makes chain maintenance much easier. Had a cheap inexpensive chain tool before purchasing this one. Highly recommended. Makes the job a lot easier. Stop using that piece of $% small, cheap wannabe and step up to a more manly one. This tool is top notch. A great investment. This is a great chain tool. The sliding silver tooth holder is great for a variety of chain widths. Well made, with replaceable pins. Great tool and a must have for great chain working. This is a well built and sturdy Park tool. Great buy for the price. It is used in the bike shops in this area and was recommended to me by a local bike store owner. Even if you don't think you'll ever need it, get one because it's better to have it and not need it, than to need it and not have it.